Having looked into the benefits of swimming, and its suitability as a central form of exercise in both weight control and fitness programs, we now look at another exercise form that is incredibly effective and easy to fit into daily routines, that is using a rowing machine. How many of you remember Kevin Spacey from ‘House of Cards’, breaking a sweat on the rowing machine, in his basement? Whether at the gym or in your own home, a rowing machine presents a great way to get some exercise, and a fun alternative to elliptical machines we looked into earlier. So today we are going to look at the benefits of rowing as an exercise, how to master rowing for maximum effect, and then take a look at some of the best machines on the market today for your home gym. For daily exercise, whether it is for fitness, muscle gain or weight control, or even a combination of those, finding the most effective activity that fits into your particular daily life and that suits you is an important step on the way to achieving your goals. Rowing machine offers a, low impact way to exercise the whole body, and with a wide choice available, you can have one in your home to use when convenient, for an economical cost, bringing many benefits. Like swimming, rowing on machines is a low impact form of exercise, this means that there is little impact stress put on the body, as there is in running, for instance. This means rowing is better suited for those with weaker joints, such as people who are a little older, or those recovering from injury or who are prone to stress injuries of any kind. Using a rowing machine is a very effective form of exercise, and one of the main reasons for that is that it does not just focus on a single area of the body, rowing utilizes all the main muscle groups to provide whole body exercise as well as full cardiovascular workout. That is not all, not only does the whole body benefit from using a rowing machine, but it benefits in more than one way.. Add that to the cardiovascular benefits you get from rowing and you have an almost perfect exercise. For those looking for an exercise for weight control, rowing is about as good as it gets. Because it is a whole body workout, for a given effort and time, your body uses up more calories of energy participating in rowing exercise as they would running or cycling, simply because more muscles are being used. At about 15% more, the difference is significant as well, making weight control an easier prospect, and is perhaps one of the real benefits of using a rowing machine that people will notice very quickly. The Catch – Legs bent in the stirrups, lean forward and grab the handles. The Drive – Keeping a straight back and the arms locked at full stretch, drive backwards with the legs until they are straight, lean back and then pull with the arms, bending the elbows. The Finish – Complete the pull with the arms until the handle reaches your lower chest. Keep the back and legs straight. The Recovery – is more or less the reverse, straighten the arms and as they reach full extension, lean forwards and then bend the legs to return to the starting position. Practice, as with everything, helps, but concentrate on getting everything in the right order in fluid motion, and build speed after. For rowing machine workouts, using varying effort, such as 10 minutes high pace, 10 minutes slower, can help build fitness quickly. If you are new to workouts, keep going as long as you can to begin with, for those with more experience, 1 hour sessions with varying pace as described give you a great aerobic workout and build muscle tone as well. With the benefits of rowing now clear, and even understanding how to use the machine and some workouts to get the most from it, you may be thinking about investing in your own machine at home for maximum convenience, rather than rely on equipment at a gym. We have looked at the machines currently available and picked out what we think are the best choices of the various types or rowing machine for sale right now. Indoor rowing is an effective full-body, low-impact workout. Flywheel design minimizes noise while maximizing a smooth feel. 14-inch seat height, nickel-plated chain, adjustable footrests and ergonomic handle. The first rowing machine we think is work looking at is the Concept2 Model D Indoor Rowing Machine with PM5, the latest version of one of the real market leaders. Replacing our previous favorite, the Concept2 Model D Indoor Rowing Machine with PM3, it adds an improved performance monitor and a whole host of detail changes to an already class leading design. Easy to setup and collapsible for storage, you can be up and running, or more precisely rowing, in minutes, as one reviewer said “had this machine together in literally less than 10 minutes. There are just 8 screws. (They even included a screwdriver – no hunting for the right size!)”. Other reviewers noted the effectiveness of the workout, with one stating “I could feel the difference in muscles that have not been used for a long time”. A high quality, easy to use rowing machine that is at the top of the list for a reason. Handcrafted rowing machine with “water flywheel” that replicates actual rowing feel. Solid ash construction absorbs sound and vibration; designed for high-traffic areas. Stores upright; measures 84 x 21 x 22 inches (W x H x D) and weighs 117 pounds. Some people prefer the more natural feel of the varying resistance that you get from water rowing machines, that is, those that use a water tank as the resistance tool in the machine. For competitive on-water rowers there is much to recommend them as an indoor trainer as well. With that in mind, we have picked out the water rower we think offer the best solution on the market today. Our choice is the WaterRower Club Rowing Machine in Ash Wood with S4 Monitor, which is also available in a slightly different finish as the WaterRower Natural Rowing Machine in Ash Wood with S4 Monitor. The functionality is the same in either machine, your preference for aesthetics being the deciding factor between the two. Handmade from Ash, these machines are built around a water tank flywheel that replicates the ebb and flow of resistance found in on-water rowing. Highlights of the Water Rower machine are the low levels of noise in use, nearly all reviewers commented on how quiet it is, one noting that “It is really quiet, and smooth in operation”, and the space saving design for storage, where the whole thing folds vertically and fits into a surprisingly small space when not in use. Although it requires assembly when purchased, like most rowers, it is easy to put together, one reviewer noting that “Assembly was quick and easy and directions were easy to follow”. Effective exercise with a natural twist, the WaterRower machines bring something different to the home gym. Well made, reliable and great to use, if you are looking for a water rower, these are definitely the choice to make. Seated row machine helps users build depth in middle back. Four-way hand grips can widen or narrow to target resistance to mid-back. Convenient design is adjustable to fit users of all sizes. Extra-thick DuraFirm seat and chest pads are soft yet supportive. Oil-lite bronze brushings at all pivot points keep machine running smoothly. A variation on the rowing machine idea, the seated rowing machine takes the fundamental mechanics of the rowing machine and uses them to direct a workout to specific body parts. By removing skidding seat the leg part of the exercise is eliminated, instead the design focuses on arms and the hard to reach middle and lower back area for the workout. Nowhere near as popular as the traditional machine, seated rowing machines are nevertheless incredibly useful for building back and shoulder muscles, and our pick is the Body-Solid GSRM40 Seated Row Machine, an extremely well built piece of equipment that comes with a whole host of features. The solid construction of this machine hits you as soon as you see it, as one reviewer notes “it’s sturdy enough to handle whatever you’re capable of”, and incredibly effective at targeted back muscle development. A reviewer said that “During workout you can feel Back Muscles working you haven’t felt before”. For anyone who is struggling with T-Bar rows whether through back pain or injury, the Body-Solid machine offers a real alternative that is easy to use and protects the back from injury while helping strengthen the muscles supporting it. Definitely the best available of its type. Home rowing machine with compact footprint–23.5 x 46 inches. Monitor shows time, stroke count, and calories burned. Air rowers use wind to provide the resistance for the workout, these tend to be a little more noisy than other types of rower, but market leader Stamina have also developed systems using shock absorber type resistance units that use air under pressure to provide the resistance in use. All of these air based systems offer good value for money, and we have picked out 3 of the Stamina range that represent the very best air based solutions available. We start with the Stamina Body Trac Glider 1050 Rowing Machine, a compact, simple to use rower that has no flywheel at all, but instead uses two solid ‘oars’ and a sliding seat that offer resistance through shock absorber type units underneath. While it is very compact, the unit is also very sturdy, using steel construction to provide confidence, the unique design of actual ‘oars’ draws a lot of praise from reviewers, with comments including “I like the free rowing arms (as opposed to a bar like I’ve seen at gyms), gives the feel of a real row boat and also allows for exercising different parts of arms and back”. Some reviewers have found the computer a little difficult to use, and the foot strap is not quite as secure as they would like, but overall this machine scores highly with users, “Great product for a beginner who wants a good toning workout” as one put it. Overall, it is a well-made, effective machine, perfect for starting out. Our next pick is a true air resistance machine, the Stamina Air Rower, this strong yet compact machine uses a large fan for building resistance into the exercise. Easy to put together, this machine has been noted for its sturdy construction and ease of use, one reviewer suggested that “This is an easy to assemble and sturdy machine. It is easy to fold up and move around”. In use, it does fall prey to the problem that all air rowers have, and that is noise. This is unavoidable and is a product of the use of a fan for resistance, not overpowering, it is noisier than other designs such as water or magnetic resistance however. Compact rowing machine with full range-of-motion rowing that mimics rowing on the water. Smooth hydraulic cylinder resistance; adjustable tension controls. Single button monitor shows speed, distance, time, row count, calories burned, and miles rowed. Thick, padded seat; pivoting foot plates. Some assembly required; 5-year warranty on frame, 90 days on parts. Strong, effective and easy to store, this is the best of the air resistance rowers, is you can live with the added noise of the air design, this Stamina Air rower will serve you well. The final model of Stamina’s range we are looking at is the Stamina 1215 Orbital Rowing Machine with Free Motion Arms, this uses hydraulic cylinders, rather than the has shock absorbers of the earlier model, to provide resistance. The under-slung resistance cylinders make this a very compact unit, and the free motion arms replicate the oar action very well too. Made from steel for a strong construction and with a monitor that shows time and calories used among other data, it is a comprehensive unit that has many advantages. Very useful in smaller spaces due to the compact size its design allows, this works on the same principals as the Body-Trac Glider 1050 we looked at previously, except it uses hydraulic rather than gas shock absorbers for the resistance for a smoother, more adjustable action. One reviewer discussed the arms, “The orbital feature is nice, for it allows you to use different muscles while rowing, by placing the handles in various positions during the workout”. Another notes “It doesn’t hurt my bad knees, gives me a good, almost full body workout and is quiet enough that I can listen to TV or Audible while working out”. Definitely one for those looking for a compact solution at home. Combination rowing machine and recumbent exercise bike for total body workouts. 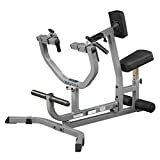 Top bar for performing upper body exercises, such as bicep curls and tricep kickbacks. Electronic monitor with large LCD display tracks speed, time, calories, distance, and more. 8 levels of smooth, quiet magnetic resistance; hand-pulse sensor built into grips. 250-pound weight capacity; measures 74.5 x 25.5 x 10 inches (W x H x D). For those that like to cycle as well, or prefer to alternate exercise types to prevent boredom, the combination machines have a lot to offer. A recumbent and rower combination machine allows cycling exercise and rowing exercise from a single machine, perfect if you are working with limited space at home. One of the issues that you can find with multipurpose machines is that they do nothing well, but that is happily not the case here. The Stamina machine is excellent for both rowing and cycling, and is easy to swap between the two, one reviewer observing “I can go from bike to rower in seconds”. Lack of noise is another benefit of the magnetic resistance, “I cannot believe how quiet it is” just one of the many observations about the lack of noise. For a full workout and a choice of cycling or rowing, the Stamina 15-9003 Deluxe Conversion II Recumbent / Rower is the best option available today.